Media captionBlack MP Dawn Butler says another member told her "this lift really isn't for cleaners"
A black MP has said she was the victim of racism in Westminster when she was mistaken as a cleaner by an MP. 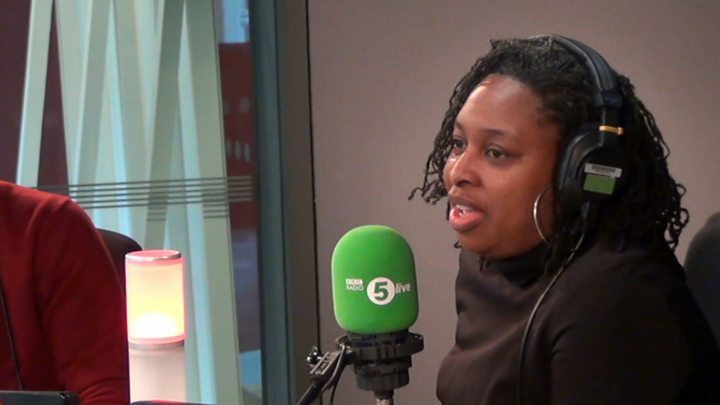 Dawn Butler told BBC 5 Radio Live she was in a members-only lift when an unnamed Commons member told her: "This lift really isn't for cleaners." The Labour MP for Brent Central said it had been one of "so many incidents" of racism she had encountered while in Parliament. The 46-year-old became an MP in 2005 and was re-elected last year. Former London mayor Ken Livingstone said that for Ms Butler to be confronted in such a manner was "ridiculous" as "she was elected years ago" and "gets up and speaks" in the chamber. Ms Butler, the daughter of Jamaican immigrants, has previously described other instances of racism in the Commons. Writing for the Fawcett Society in 2008, she said she was once confronted by a former minister who queried whether she was allowed in the members area on the terrace. She wrote that when she told him she was an MP, he replied: "They're letting anybody in nowadays."